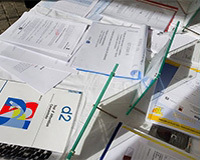 of the Study of Work and Vocational Guidance - Inetop, from 17 to 19 march 2010 at the Cnam in Paris. This international conference will bring together and compare more than 60 contributions from researchers and practitioners involved in life-long career development and counselling through a multidisciplinary approach. Advising, counselling, assessment, interviewing, evaluation, career education, mentoring, coaching, tutoring, etc., are just some examples of the many forms of support available to individuals in their career development at different stages of their life. What models are they based on ? What conditions their effectiveness and how are they implemented ? How are they related to socio-economic developments, to new training and work systems and changes in society ? How can the individual's freedom of choice be reconciled with economic and business needs ? How can these career and life development interventions fit in with the individual's autonomy? Proposals from researchers and practitioners in psychology, sociology, economics, education, management, etc. are welcome. Argentina, Belgium, Canada, France, Great Britain, Italy, Ireland, Luxembourg, Netherlands, Poland, Portugal, United States, Switzerland. The conference "Counselling for Life Design" will be held in Paris and is hosted by the Conservatoire National des Arts et Metiers (Cnam). The Cnam is located at : 292, rue Saint-Martin, Paris 3e, which is the main location for the conference.